Roman blinds are stylish and elegant, they look stunning when used on their own for a minimalist look or teamed with curtains. Roman blinds are ideal if you have a radiator under the window but still want long curtains for a dramatic effect - just pull down the blinds at night. You can also have your blind interlined for extra insulation or have blackout lining for bedrooms. Our roman blinds are hand finished with pockets formed in the lining for rods, which are then stab stitched through to the front of the fabric so no visible stitch lines shows. The stab stitching is done approx 8 - 10 cm apart through linings and fabric to ensure fabrics are securely anchored together. 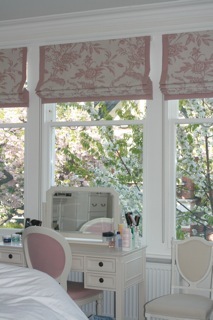 The finished blinds are fitted to a high quality roman blind track which is guaranteed for 10 years. The track is easy to to fit and simple to operate using a continuous chain system to control the blind thus eliminating the need for unsightly cords and cleats (and wonky blinds!). The track is fully child safety compliant. The track can be repeatedly used and it is simple to replace the blind so you could change with the seasons - this is now even easier with the quick release bottom rings which complete the system. If it is a simple replacement blind return the track with your fabric or you can DIY. Interlined blinds in warm colours for autumn and winter, and lighter weight blinds for the summer. If you move house and want a smaller size blind take the track with you, just pay for the making up cost of the blind to fit your new window.